Football season is upon us! High schools, universities and professional teams are all cramming in their last preseason practices and making tweaks to their lineups in anticipation of a grueling autumn. The NCAA season begins on August 26th while the NFL’s big opening game pitting Denver against Carolina will kickoff Thursday, September 8th. 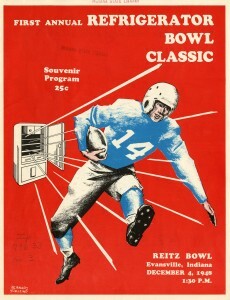 The Indiana State Library has many materials documenting football in Indiana. 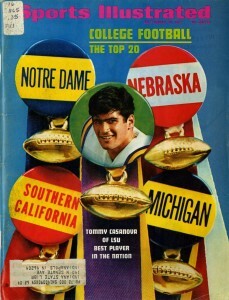 In addition to souvenir programs, season schedules and many issues of Sports Illustrated (from 1954-2009), the library possesses several books on the history of the sport, from biographies of such legends as Knute Rockne and Peyton Manning to early instructional manuals from the 1920s. You can search ISL’s catalog for materials on football at https://evergreen.lib.in.us/eg/opac/home.